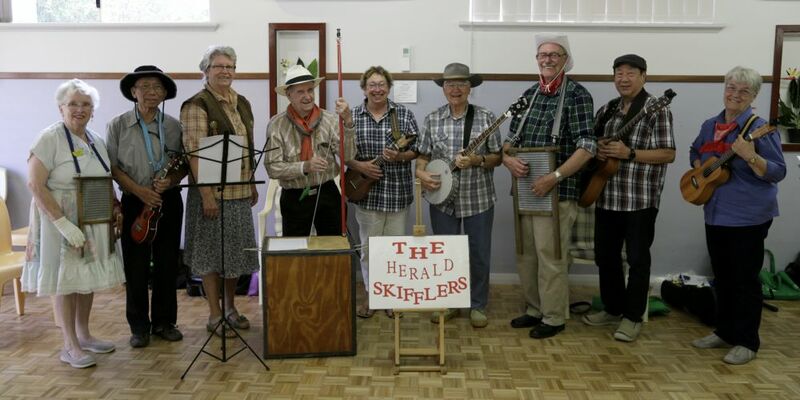 The Herald Skifflers members Margret Tanner (Beckingham), David Leonge (Winthrop), Willi Verschoof (Riverton), Dennis Leach, Meryl Jones (Mt Pleasant), Jack Rhodes (Williton) , Harry Monks (Parkwood), Frankie Tang (Canning Vale) and Christine Ross (Parkwood). DENNIS Leach is distraught after four of his harmonicas were stolen at Waterford Plaza in Karawara a few weeks ago. The 86-year-old Karawara resident was out for coffee with a friend, as is a weekly habit, when his trolley containing the harmonicas was wheeled away as he turned his back to order a drink. Mr Leach is a member of a Skiffle group who perform free shows for pension groups and aged care residents including dementia patients. Skiffle is a combination of jazz, blues and folk sounds created by manufactured, homemade and improvised instruments. “I use my harmonicas during performances,” Mr Leach said. “One of them is very sentimental, it was given to me by a language student from Curtin University who I taught. Mr Leach reported the incident to Kensington Police before contacting MLC Kate Doust. Ms Doust said the sad reality was that these types of incidents would not normally be a high priority for police. “Given the enjoyment that Mr Leach and his fellow musicians provide to our elderly community, I contacted the Office of the Minister for Police to ask if some more prompt attention could be given to the theft,” she said.